Integrated Communications or Unified Communications – which is better for SMEs? Unified Communications has long been an industry buzzword. Even before the word Cloud propagated our thoughts we knew that UC meant clever communications – software or services with voice, chat and video combined into a single solution. 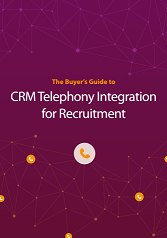 At SYNETY, once we started thinking about UC in terms of SME productivity it took us in a completely different direction – Integrated Communications offering deep integration of telephony operations into the software businesses use every day. Think of your mobile phone… you have an address book and call people and receive calls from people within the address book on the phone. This is not even a smart phone feature – dumb phones had this feature from day one and a world without the ability to dial from the mobile phone address seems utterly ridiculous today, but guess what – this is how the average business makes and receives its phone calls today – usually with an archaic system (PBX) totally isolated from their business address book (CRM). Integrated Communications solves this issue – by putting the control of communications inside the CRM system. By integrating Company’s communications capabilities with their CRM systems you combine all forms of customer contact into a central data system which is far more efficient. Think of it this way; your CRM system knows way more about your customers than any phone system on the planet – so why not leverage that fact?